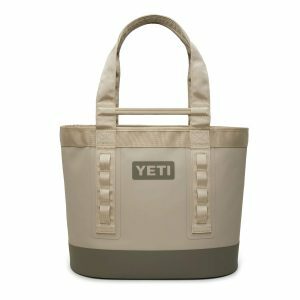 YETI Camino Carryall 35 is a rugged, multi-purpose, ready-to-go tote bag with a 35-liter capacity for everyday use. It is offered in three colors and patterns of Everglade sand, reef blue and storm gray. 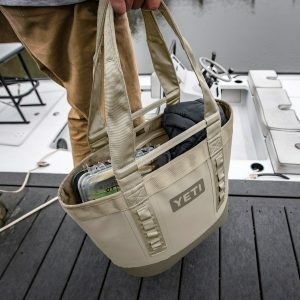 The Camino by Yeti is a convenient bag that is easy to carry, clean and maintain. With the large mouth opening you’ll have easy access to your belongings. And the EVA molded base ensures a solid and waterproof bottom that will keep the bag in a vertical position. It looks sleek, stylish and modern and the thick shell exterior with laminated, very dense nylon is resistant to water, abrasions and punctures. Being watertight, there will be no leaking in and out. With the hitch point grid you can attach or clip almost anything including bottle openers with Yeti’s carabiner and molle webbing accessories on the outside. You can carry your meals to take to the camp or your wet boots and waders in the brand new Camino Carryall. The material used on the Camino is very easy to clean with a damp cloth or just hose it down and wipe it. Your gear will be protected from the puddles and mud and sharp tools and hooks. Yeti Camino weighs 3.3 pounds and measures 18H x 14.4W inches you can carry it easily on your shoulder or by the crossbar handle. It is the perfect size, excellent all around tote bag with a simplistic design and heavy-duty, sturdy and durable construction. 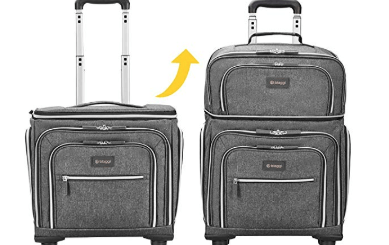 You can fit in a lot of your stuff for up to a week’s travel, use as a carry-on bag and put it in the overhead bin above your seat on the plane. It is a little too big to put under the seat in front of you. The Camino can be used on your road trips, stowed behind your car seat and to take your stuff into the hotel room. It is actually quite versatile and can be used for a variety of purposes including as a grocery bag or whatever you wish to carry on the go. There is an inside pocket where you can put your smartphone and passport, boarding pass or other small items. One of the customers ran over this bag with their truck and there was no damage on the bag. There is a stiff crossbar on the strengthened grab handles that gives you stability with heavy loads and better grip. The material is robust and tough but you can squish it under your seat or into your closet without problems. There is no zipper on the large opening of this bag to zip shut it, but a little metal G-clip to fasten the opening. At first it may appear as an expensive- overpriced bag but then you realize how good is the build quality and the design with attention to detail. Although it is not cheap, it offers great value for the dollar, which you will realize after you start using it.